What is National Maternity Voices? 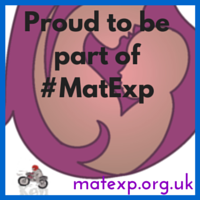 National Maternity Voices (NMV) is the national group of Maternity Voices Partnerships in England. A Maternity Voices Partnership (MVP) is a team of women and their families, commissioners and providers (midwives and doctors) working together to review and contribute to the development of local maternity care. National Maternity Voices is committed to ensuring that any data held by NMV or local MVPs will be held in compliance with UK Data Protection legislation and the EU General Data Protection Regulation. The terms “we” and “our” in this document refer to both National Maternity Voices (NMV) and local Maternity Voices Partnerships (MVP) in England. This policy explains what information we might collect from or about you, how we look after your personal information and what we do with it. The policy applies to our use of personal information about our members, supporters, service users, people who work for us and those who volunteer with us. We take the responsibility to look after your personal information very seriously. The provision of the data is voluntary. We might also collect some information about the babies of service users, for example age, gender, when and where they were born and name. We will only collect this from the parent(s) of the baby, or anyone acting for them. We might not use your personal information for all of these purposes – it will depend on our relationship with you, and how you interact with our services, website, and activities. We need a lawful basis to collect and use your personal information. Our lawful basis for the purposes that we process personal information is consent, or for the legitimate interests of National Maternity Voices and local MVPs (and where we are confident that the processing will not infringe on your rights and freedom). Usually we will only process sensitive personal data1 if we have the explicit consent of those concerned. In extreme situations, we might share your personal details with the emergency services if we believe it is in your ‘vital interests’ to do so. For example, if someone is taken ill during one of our meetings or events. We may also share your personal information if the law says we have to. If you have disclosed any information to do with issues of malpractice, safeguarding or a crime that has been or is about to be committed, we have a legal obligation to report this to the relevant bodies. The law allows personal data to be legally collected and used if it is necessary for a legitimate business interest of the organisation – as long as its use is fair and balanced and does not unduly impact the rights of the individual concerned. We will never sell personal information. We do not pass on data to other organisations unless required by law or with your specific permission. How long do we hold onto your personal information? In some circumstances, we might legally be required to retain your personal information for audit purposes. Why do we need to collect and store personal data about you? This information will be collected by National Maternity Voices or your local Maternity Voices Partnership to gain a better understanding of current local maternity services so that improvements can be made in the future. We will process your personal information in order to deliver this service safely and effectively, and where otherwise reasonably necessary for our purposes.